For this painting, I worked from photos taken on a trip with my Mother a few years ago. The colors in the ice were the most remarkable and beautiful clear turquoise blue, and the shapes of the icebergs were fascinating! 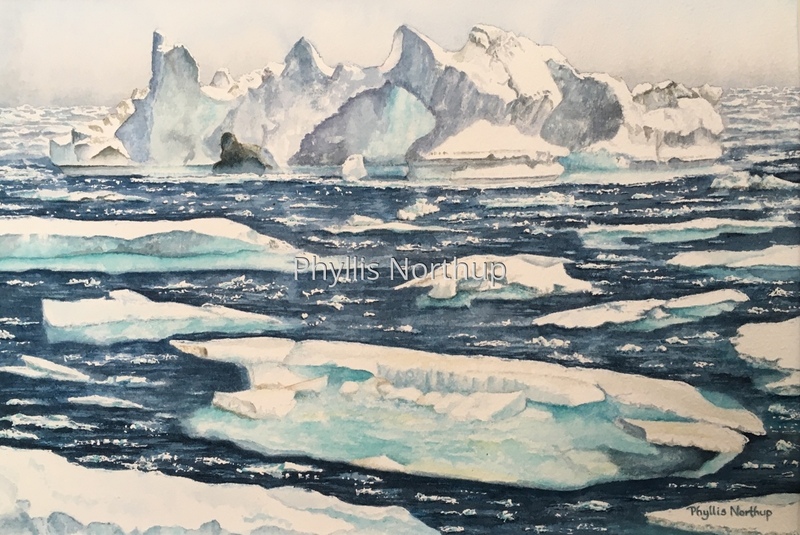 I recall the ship captain telling us he couldn’t follow the normal route because there were just too many ice bergs and big ice chunks to safely navigate it. After watching the film “Chasing Ice” during our visit last November to the Churchill Northern Studies Centre on the Hudson Bay to see and learn about polar bears, I understood why our trip in Greenland had been rerouted because of so much ice in the water. I highly recommend the movie if you haven’t seen it! Available at Middle Street Gallery through April 21.